QPWB Miami partners, Lars O. Bodnieks and Franklin G. Cosmen, Jr., (on brief), counsel for the Respondents, PLM Limited Partnership, successfully opposed a plaintiff’s petition for certiorari to the United States Supreme Court on whether the Florida appellate courts’ use of per curiam affirmance (PCA) for its decision is a denial of due process. In response to the petition that arose from adverse state appellate court rulings in a medical malpractice wrongful death action, the Respondents argued that (1) the petitioner was procedurally defaulted in seeking a writ of certiorari by having failed to follow Florida’s rules and appellate law that do not authorize appeals of non-final non-appealable orders, (2) the state appellate courts had not decided any unsettled but important question of federal law, (3), petitions for writs of certiorari on the identical or similar question of whether a Florida appellate court’s per curiam affirmance (PCA) without an opinion results in a denial of due process have been attempted in six previous cases, and rejected, (4) no federal due process right exists in having an “elaborated opinion” issued instead of a per curiam affirmance (PCA) in the disposition of a Florida state appellate court case, (5) no “compelling reasons” for the Court to grant its petition existed, and (6) no conflict existed with any decision of another United States Court of Appeals on the same matter. The United States Supreme Court denied the petition, thereby allowing the continued practice of using PCA opinions by the Florida state appellate courts. Lars O. Bodnieks is a partner with 27 years of experience in appellate practice and commercial litigation, property and casualty, admiralty and maritime, aviation, medical malpractice, product liability, negligence, wrongful death, insurance defense, interpleader, intervenor, declaratory judgement, and forfeiture actions. He has extensive trial experience in state and federal courts with over 53 jury trial to verdict and over 70 appellate cases. Bodnieks represents clients in many industries and in a wide range of legal matters. He is awarded an AV/Preeminent rating from Martindale Hubble Law Directory. 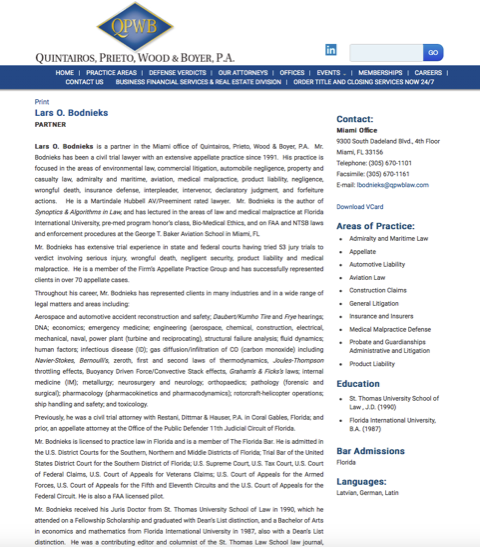 Bodnieks received his law degree in 1990 from St. Thomas University School of Law with Dean’s List distinction and is admitted to practice in Florida and the U.S. District Courts for the Southern, Northern and Middle Districts of Florida; Trial Bar of the United States District Court for the Southern District of Florida; U.S. Supreme Court, U.S. Tax Court, U.S. Court of Federal Claims, U.S. Court of Appeals for Veterans Claims; U.S. Court of Appeals for the Armed Forces, U.S. Court of Appeals for the Fifth and Eleventh Circuits and the U.S. Court of Appeals for the Federal Circuit. He is also a FAA licensed pilot. Franklin G. Cosmen, Jr., a partner in the Miami office, representing business entities in disputes arising from the sales of goods or services, and in partnership/joint venture agreements in state and federal courts, in appeals, arbitrations, mediations, and in administrative actions. He has attained a Preeminent rating of AV® from Martindale-Hubbell Law Directory. Cosmen serves a multifaceted group of clients in a broad range of matters involving information technology, professional liability, real estate/construction litigation, banking and finance and intellectual property. He has extensive experience handling coverage claims and defending insurers against extracontractual “bad faith” actions, premises liability, products liability, and commercial airline warranty claims. His practice also focuses in the areas related to real property title actions, commercial collections, fraudulent practices, debt collections, defense of Fair Credit Reporting Act claims, contractual issues, and includes the prosecution and defense of mortgage defaults. Cosmen received his Juris Doctor, with honors, from St. Thomas University School of Law, Miami, Florida and is admitted to practice in Florida and the U.S. District Courts for the Southern, Middle, and Northern Districts of Florida, U.S. Court of Appeals Eleventh Circuit and United States Supreme Court. He served in the United States Air Force for 11 years.